It’s been the debate that just keeps grasping at straws, but with only a week left until all speculation becomes either reality or fiction, it’s time to take one last look at the Toronto Maple Leafs’ expansion draft plans. More particularly, the case for protecting, or even better— not protecting Matt Martin. There’s no question that Toronto has one of the easier routes to go when choosing who to protect for the expansion draft. Most of the core players on the team aren’t eligible to be selected by Vegas and the ones that are can be protected with even more spots still remaining. But what should the Leafs do with those remaining spots? Right off the bat, Auston Matthews, Mitch Marner, William Nylander and Zach Hyman are safe, then James van Riemsdyk, Nazem Kadri, Tyler Bozak, Leo Komarov and Connor Brown are all locks to be protected. This leaves two spots open and a whole lot of players down the depth chart to choose from. Realistically, the final two spots come down to five players: Matt Martin, Josh Leivo, Brendan Leipsic, Kerby Rychel and Seth Griffith. Given the re-signing of Ben Smith, Toronto now has two forwards in Smith and Eric Fehr who are eligible to be exposed, leaving all signs pointed to Martin being protected — but he shouldn’t be. Martin was an underrated part of Toronto’s success this year. He brings toughness to a Leafs group that hasn’t really had anyone to stand up for players on the team in a long time. Considering it was the rookie season for Matthews, Marner and Nylander, his presence was key for a smooth adjustment into the league. But the adjustment phase is now starting to become visible in the rear-view mirror and it will soon become a question of how long Matt Martin will continue to serve a purpose in Toronto. Martin will be in Toronto for another three years. That may seem like a while, but in comparison, Matthews, Marner, Reilly, Nylander and Co. could be around for over a decade. Martin is important now, but years down the line, he’ll be an afterthought in the minds of Leaf fans. By leaving him unprotected, Toronto can have their pick at protecting two prospects rather than one. 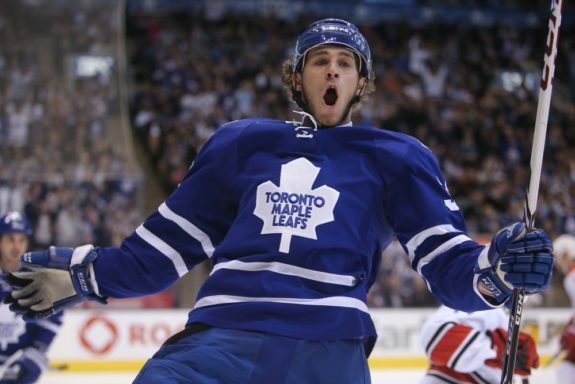 Out of Leivo, Leipsic, Rychel and Griffith, Toronto will get the option of deciding who could become a core piece for the Leafs down the line, instead of putting the decision in George McPhee’s hands. Josh Leivo performed well in limited action this season (Tom Szczerbowski-USA TODAY Sports). By leaving three prospects exposed, they’re taking a gamble that whoever they protect can be an asset moving into the future. By protecting two, the risk is limited. All four of the prospects listed have all been powerhouses in the AHL and they deserve a real shot in the big leagues, but by protecting Martin, the Leafs may not be able to hold onto all of them. When Martin was signed to a four-year deal worth $2.5 million per season in July 2016, it quickly started turning heads and raising eyebrows. It’s not often an “enforcer” gets that kind of a deal. Realistically it wasn’t the worst deal in the world — at $2.5 million compared to Bobby Ryan’s $7.25 million, Martin was a steal. That being said, Martin at $2.5 million for another three years isn’t the most attractive contract by any means and it’s unlikely the Golden Knights want to take on that contract. Vegas has said they’re willing to take on bad contracts for assets, meaning they may not end up with anywhere near as much cap space as people think. It’s doubtful they’d take a long look at Martin and will more than likely be spending their time evaluating Toronto’s prospect pool anyways. As we build our roster, George McPhee says we may take on other teams’ big contracts…for a price? In the first year of his deal, Martin didn’t contribute a ton offensively, but he was still hugely important in protecting all of Toronto’s emerging young talent. He’ll probably be important next year too. But after that, it’s hard to think Martin won’t become a burden for the Leafs. That sounds harsh and that’s not the intention, but it’s the truth. Toronto has so many capable young wingers coming up — Brendan Leipsic, Kerby Rychel, Josh Leivo, Andreas Johnsson, Carl Grundstrom — this list goes on. But the Leafs only have so many open spots and realistically after this year, Toronto is probably going to be a top team in the East. Any of these forwards can be assets to the Leafs down the line and if the Leafs want to be a contender, it’s important for them to be able to roll four lines with a left winger who can put up more than nine points in an 82-game season. When it’s all said and done, Martin is a key piece for the Leafs, but only for a limited amount of time, however it looks as though he will probably end up being protected. Though the decision is significantly less important than a decision like Dumba or Brodin in Minnesota or what to do with Vatanen in Anaheim, Toronto should be taking this opportunity to look towards the future.